There was a time when the idea of repairing or replacing one’s sewer or water line was cause for serious concern. Fortunately, those days are behind us. Yes, this type of service is still a pretty big undertaking, but modern technology makes it a much more manageable job than it ever was in the past. Not all plumbers have access to this technology, of course, nor is every plumber trained and experienced enough to use it properly. The professional plumbers on our staff, though, most certainly are. When you are ready to schedule your water or sewer line repairs or replacement services, ours is the number to dial. We’ll get the job done using trenchless technology in Sarasota, FL. 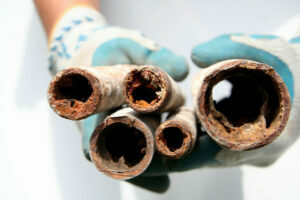 Some homeowners never have a problem with their water or sewer lines. Many others, though, encounter the types of problems that will require professional repair services, or even the replacement of those pipes. Perhaps the pipe is damaged during a construction project, has corroded over time, is severely clogged up, or is full of tree roots. Whatever the issue, the solution used to be quite a headache. A trench would have to be excavated above the length of the pipe, exposing it so that a team of plumbers could determine what wrong and go about completing the necessary services. With trenchless technology, though, this process is seriously streamlined. The whole pipe won’t have to be excavated. Instead, two pits are dug out, one at either end of the pipe. A pneumatic machine pulls a new pipe, or a pipe liner, into place. The old pipe is either split or broken up by a bursting head, or forced out the other end as the new pipe is drawn into place. The benefits of this practice are many. The work can be done much more quickly, and with less expense than if a full excavation were necessary. Plus, there is minimal disruption to the property. To learn more about trenchless technology, or to schedule service, call Wimpy’s Dependable Plumbing.